Before surgery an anaesthetic will be given to either numb the area that is to be operated on or to make the patient unconscious. Depending on the surgery and the patient, there are different types of anaesthetic that can be given. Anaesthetics are a major part of surgery and if you are considering travelling abroad for surgery, this should be a consideration that is discussed with your surgeon. During your consultations with either your medical service provider or your surgeon, you should bring up the subject of anaesthetics. Due to the safety aspects of this field, all anaesthetists are either qualified doctors or specially trained medical staff. It is in your own best interests to find out if the clinic or hospital you are using uses a professional who is qualified to administer the anaesthetic. You should also ask about the type, or types of anaesthetic that will be used during the procedure. A local anaesthetic, sometimes known as a regional anaesthetic, works by freezing the area to be treated. Effectively the anaesthetic blocks the nerves to the part of the body to be treated and stops any pain. A local anaesthetic will usually be injected and the patient may still feel pressure to the area but no pain should be felt if the anaesthetic is administered correctly. The risk of any complications with a local anaesthetic is quite low and will usually only occur if the injection is made in the wrong place. The injection will usually be administered very slowly as a large amount of anaesthetic injected into a vein can cause cardiac arrest or convulsions. There may be cases of paralysis or weakness in the area that has been numbed but this will eventually wear off. A general anaesthetic is seen by many as a more serious option; it is used to render the patient unconscious, and is used for major invasive surgeries. In reality a general anaesthetic is as safe as a local in the hands of a professional. A general anaesthetic will be administered by either injection or by the patient inhaling the anaesthetic. The risks with the administration of a general anaesthetic usually take the form of nausea and vomiting directly after awakening. The patient may be administered some form of anti-sickness medicine to counter balance this. In very rare cases there may be allergic reactions, high blood pressure and some kidney or liver damage. A pre surgery screening should ascertain the suitability of the patient to undergo a general anaesthetic. 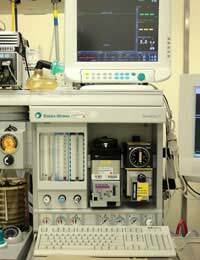 Fatal risks of general anaesthetic are usually 1 in 10,000 people. Most dental surgery that will involve some pain to the patient will use a local anaesthetic to numb the area to be treated. Recently more and more dentists have been offering the option of sedation using injection or inhalation methods. This is particularly useful for patients who are very nervous of dental procedures; it is also helpful for the dentist as a relaxed patient is unlikely to make any sudden moves and is more co-operative. When administered by professionals the types of anaesthetic described above have very low risks of any complications. Patients who take a more active approach in their research and thoroughly discuss the types of anaesthetic for their particular procedure should feel more happy and relaxed with the whole surgical process.